While playing table tennis, it could challenge to record the score while playing. It is the main reason the table tennis scoreboard was invented. It is created with the purpose to help in releasing our burden on remembering the score while we are focused on our game. 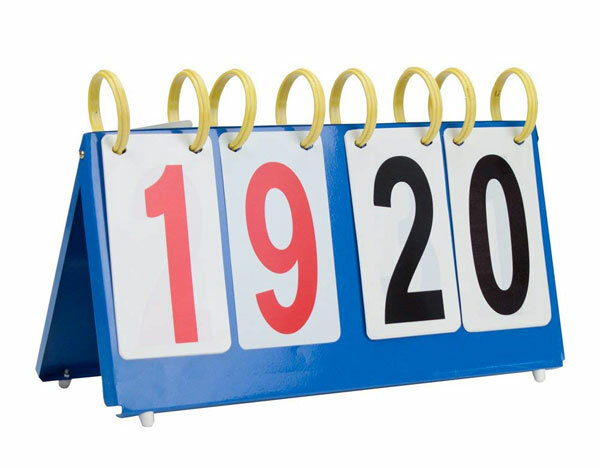 The table tennis scoreboard is a device used for recording and displaying scores in official competitions. Originally, the number cards were manually flipped, and a special person was required to flip the number card during the game. With the development of new technology, it has been replaced by electronic devices. In recent years, there have been table tennis scoreboards used in mobile phones and tablets as well. The traditional scoreboard requires a person to flip it during a match. It is easy to operate and is very low cost. You can order it in the sporting goods store, or you can make it yourself. But the large scoreboard needed in large competition venues is costly and is difficult to operate. The traditional scoreboard has not been able to meet the demand. In some large-scale competitions, because there are more viewers, more large-scale devices are needed to display the results of the competition. To cater to such demand, various electronic devices have emerged. The size and operation mode can be customized and widely used in competitions. 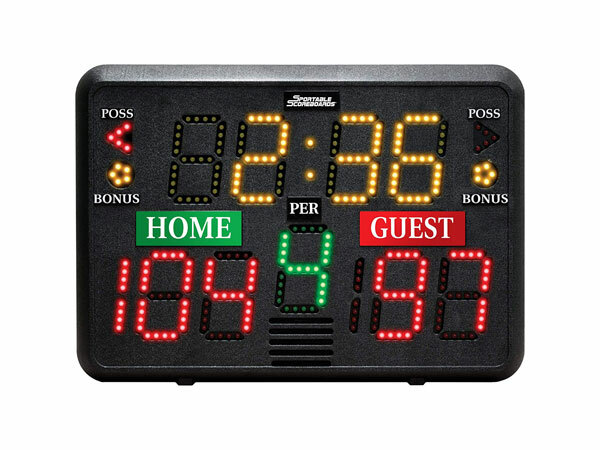 There are many specifications and manufacturers of electronic scoreboards. Generally, regular competition venues need to be ordered by manufacturers, and on-site construction is required. Because of this, the cost is also higher. Using table tennis scoreboard app to record and display the score on mobile phones is very easy and convenient. This can become a portable digital scoreboard since we are carrying our mobile phone with us wherever we go. By having the scoreboard app install on the phone, it can be used not only for professional competitions but also for leisure play between amateur players. In addition to the ability to display and change scores, the app also featured with audio, where it can announce the scores, prompts players changing serve, and it can carry out the summary and statistics work as well. Moreover, the mobile scoreboard can also use the wireless communication technology such as WIFI or Bluetooth to sync the score with the big electronic scoreboard screen of the tournament spot. This makes it possible to enable a real-time synchronization of the game score. It is really a good helper for the referee who judges in an official match. It’s usual for having table tennis matches in regional contests without an umpire. Thus, we are on our own to keep the score ourselves. Therefore, we will need to have a scorekeeper for that. 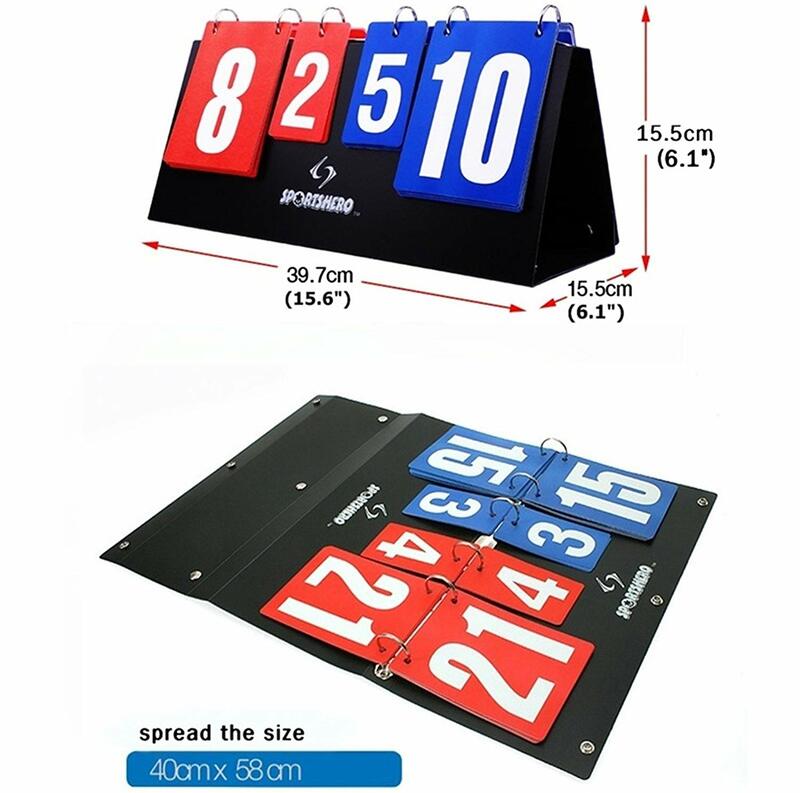 A scoreboard not only can be used for table tennis sport, but it can also be used for many other sports like volleyball, basketball, netball, tennis and many more. As of now, you can find a lot of different scoreboards online. I would love to show you some of them which I think is good for you to have if you are serious about playing table tennis. This scoreboard is lightweight. It only carries less than 2 pounds. The board is foldable which is easy to keep and store. It is featured with a spiral notebook style which makes it has a very sleek look. 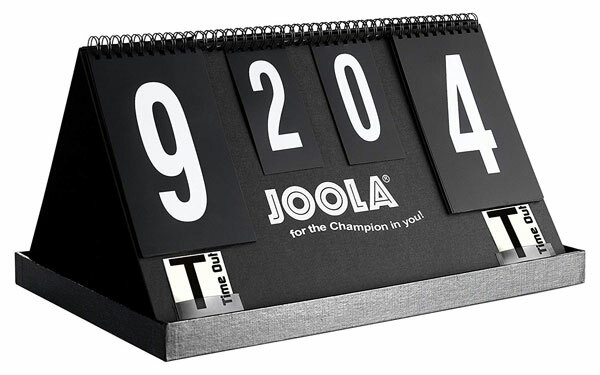 You can buy this JOOLA scoreboard from Amazon. The Killerspin table tennis fantasy scoreboard is ideal for both recreational and serious tournament play. Someone can use it to keep track of high-scoring games. It will help you keep monitor of scores in thrilling matches. This scoreboard is simple and easy to use. It is a piece of ideal equipment for almost all levels of game-play. You can get this one from Amazon. The scoreboard allows gameplay for up to 7 sets. The maximum score it can flip is 30. The material that used to construct this piece of equipment is PVC coating. The numbers are built with vinyl and are sturdy stick on the board. The board is large, so there is no problem for you to see even from a faraway distance. You can buy this one from Amazon. This table tennis scoreboard from Crown Sporting Goods is featured with bold and clear numbers. The design with 2″ ridged rings make it easy to flip. 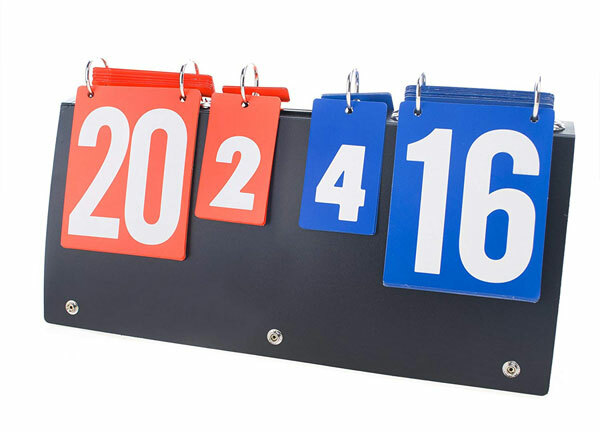 This scorekeeper is ideal to be used in just any sport. It is not an electronic device thus there is no need for electric or battery. All you need to do is just take it out and place on the table and you can use it right away. You can click this link and buy from Amazon. This scoreboard is used stainless steel and hard plastic. It is sturdy and durable. This scorekeeper is ideally for the outdoor game and it is water-resistant. 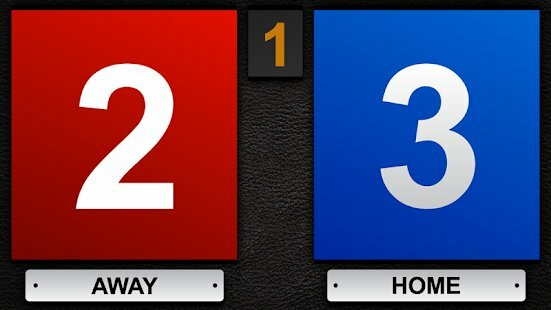 The number cards are displayed in blue and red to really make it clear which score belongs to which player. The big numbers can count up to 31 while the small numbers for the set can count for up to 7. Follow this link and buy from Amazon. If you are looking for an electronic table tennis scoreboard that you may consider having this Sportable Electronic Scoreboards. It is a lightweight scoreboard built with LED display technology. It can offer you many hours of utilization with no maintenance. The number displayed on the board is very bright. It can display in 3 different colors which are red, yellow, and green. With the availability of different timer modes, you can also use it for your interval training. You can buy this scoreboard from Amazon. There are some scoreboard apps for both IOS and Android. The one that I think worth recommending is the Scoreboard Free from Sound House LLC. This is a very simplest scoreboard app for everyone to use. It offers you various selections of the scoreboard and it runs smoothly on the phone. You can try it out yourself and most probably you will like it. You can download this free scoreboard app by follow this link.